Where in the World is Willis George Dollaway? Where in the World is Willis G. Dollaway? Once I have identified an ancestor, I start my research by finding the ancestor I am researching in the census records. Usually, I start with the most recent census date and work backwards. I am creating tables for each ancestor with the census information. This helps me to see where I am missing information and what next steps I need to take in my research. Below is the table for Kirk's great grandfather, Willis G. Dollaway, who married Francis Denny. I have been unable to find Willis in the 1920 U.S. Federal Census. 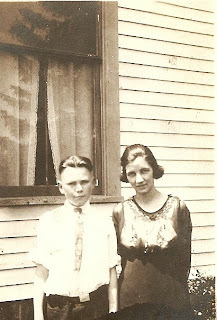 Willis and Francis Dollaway would have had teenage children in the home during 1920. I found Wm. 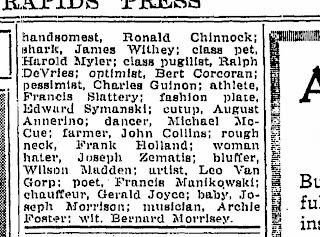 and his daughter, Leona, Dollaway living at 150 Maple Street in Grand Rapids, in 1921, through the 1921 Grand Rapids City Directory. There is not a listing in the 1920 Grand Rapids City Directory for them. Where are you hiding Willis G. Dollaway? The Grand Rapids Public Library has 3 x 5 cards filed alphabetically by last name in an old card catalog file. These surname card files have been a wealth of information for Kirk's Grand Rapids roots. 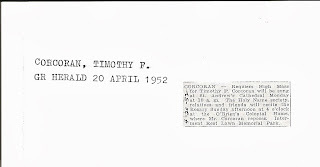 The information that I found for Corcoran, Timothy F. is a funeral notice. 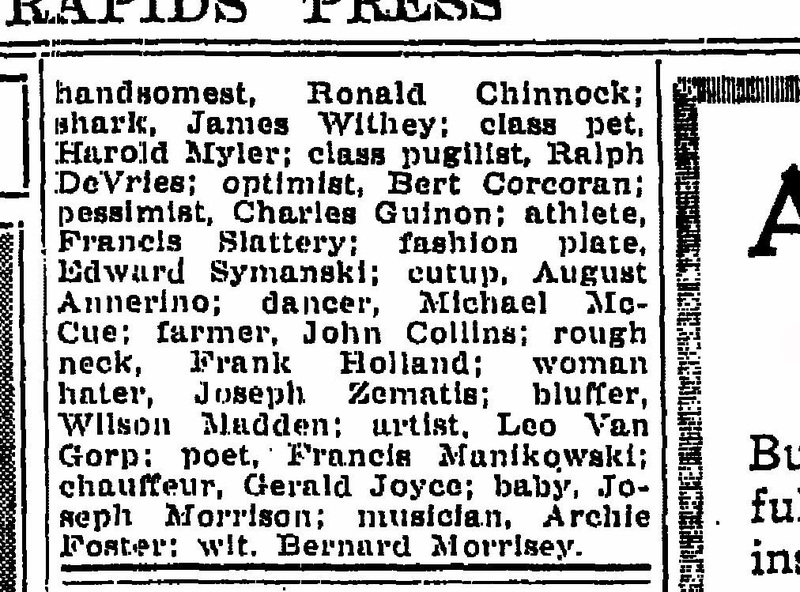 In addition to the funeral notice being on the card, they put the name of the newspaper and date of publication. I have found this to be a very useful source to check. If you have Grand Rapids and surrounding area research to do, I recommend checking out this resource at the Main Grand Rapids Public Library on Level 4. CORCORAN- Requiem High Mass for Timothy F. Corcoran will be sung at 10 a.m. The Holy Name society, relatives and friends will recite the Rosary Sunday afternoon at 4 o'clock at the O'Briens Colonial Home, where Mr. Corcoran reposes. Interment Rest Lawn Memorial Park. Howard James Corcoran, son of Timothy Corcoran and Helen Corcoran, nee Schmitt was born 9 Feb 1907 in Chicago, Cook, Illinois. He died 21 May 1960 in Grand Rapids, Kent, Michigan. Howard is buried in Restlawn Cemetery, Grand Rapids, Michigan next to his parents. Where in the World is Timothy F. Corcoran? 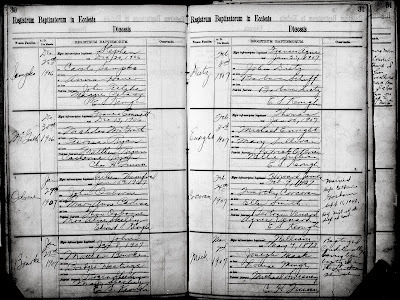 One of the first records I look for when researching an ancestor is the census record. I try to follow my subject through the years in the census. Nothing frustrates me more than when I cannot locate the ancestor in the census record. I know he/she did not fall off the face of the earth, so where are they hiding? 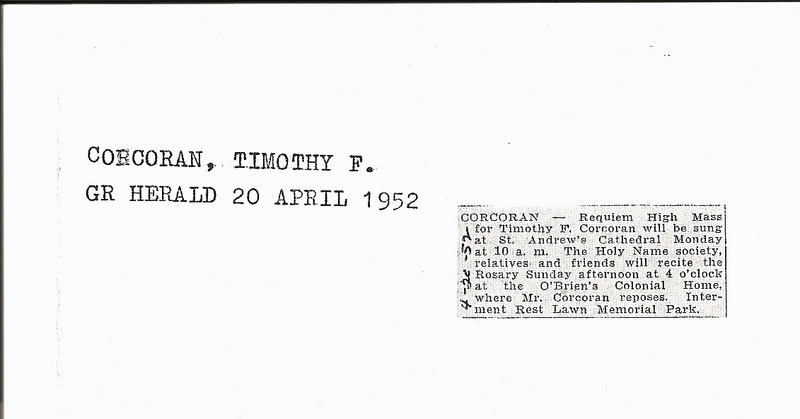 In the case of Timothy Corcoran, I can't find him in two censuses. Timothy would be four years old in 1880, but I cannot find his family, who I believe is father, Timothy; sisters, Hannah and Josie; brothers, John, James, and Patrick. Timothy was born in Chicago, Illinois and I thought they would be living in Illinois during this time. Timothy was 23 in the 1900 Census. 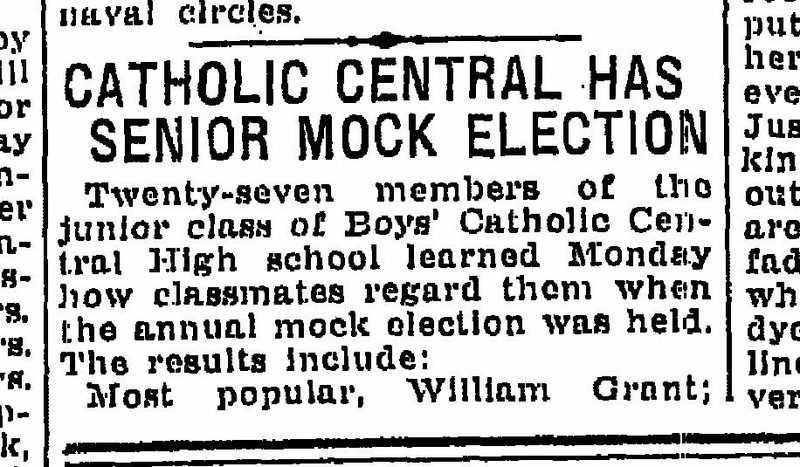 The census that year was taken in June. Timothy married Helen Smith (Schmitt) on 5 June 1900 in Pullman, Cook, Illinois. Did this contribute to my not finding him? I have been known to go through the census, page by page, but I am not ready to attempt that for Chicago! The table below shows where in the world Timothy Corcoran was? If you have any information on this family, please leave a note. I am going to find Timothy in the other census dates. 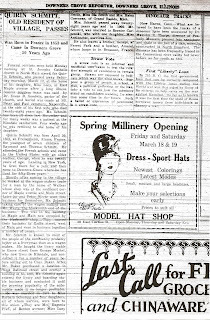 Source: Quirin Schmitt, Downers Grove Reporter, Downers Grove, Illinois, 13 March 1927, obituary for Quirin Schmitt, page 3; column 4 and 5. Funeral services were held Monday morning at St. Joseph's Catholic church in North Main street, for Quirin Schmitt, who passed away Saturday morning, March 12 at the home of his daughter, Miss Lucy, in East Maple avenue after a long illness. Solemn requiem mass was said by Dr. Eneas B. Goodwin, pastor of the church and burial was made at SS Peter and Paul Cemetery, Naperville at the side of his first wife who died twenty eight years ago. Mr. Schmitt has been ill since last November and for many weeks was a patient at the Hinsdale sanitarium. Four weeks ago he was removed to the home of his daughter. Quirin Schmitt was born April 30, 1853 at Freisenheim, Alsace, France, the youngest of seven children of Raymond and Theresa Schmitt. He attended the French schools and came to the United States with an older brother, George, when he was twenty years of age. Landing in New York, he lived there for a year and then came to Downers Grove where he has lived for fifty three years. 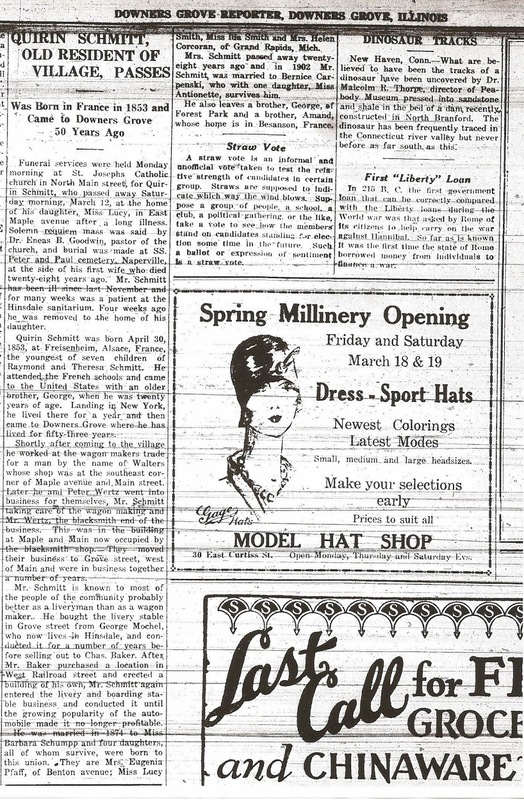 Shortly after coming to the village he worked at the wagon makers trade for a man by the name of Walters whose shop was at the southeast corner of Maple avenue and Main street. Later he and Peter Wertz went into business. This was in the building at Maple and Main now occupied by the blacksmith shop. They moved their business to Grove street, west of Main and were in business together a number of years. Mr. Schmitt is known to most of the people of the community probably better as a liveryman than as a wagon maker. He bought the livery stable in Grove street from George Mochel, who now lives in Hinsdale, and conducted it for a number of years before selling out to Chas. Baker. After Mr. Baker purchased a location in West Railroad street and erected a building of his own, Mr. Schmitt again entered the livery and boarding stable business and conducted it until the growing popularity of the automobile made it no longer profitable. He was married in 1874 to Miss Barbara Schumpp and four daughters, all of whom survive, were born to this union. They are Mrs. Eugenia Pfaff, of Benton avenue; Miss Lucy Smith, Miss Ida Smith, and Mrs. Helen Corcoran of Grand Rapids, Mich.
Mrs. Schmitt passed away twenty eight years ago and in 1902 Mr. Schmitt was married to Bernice Carpenski, who with one daughter, Miss Antionette, survives him. He also leaves a brother, George, of Forest Park and a brother, Amand, whose home is in Besanson, France. This obituary is one of the great ones in my genealogy collection. Prior to this obituary, I hadn't know much about Quirin Schmitt, Kirk's great, great grandfather. Kirk and I, on one of our trips to visit our daughter, Kirsten, in Chicago, decided to take a side trip to Downers Grove, Illinois. We went to the Downer's Grove library and did a little research. It is here that I found Quirin's obituary. I found other information that corroborates much of what was in his obituary. Quirin Schmitt was an early resident of Downer's Grove and information on him can be found in early histories of the area. I was able to research Quirin further from the information in his obituary. 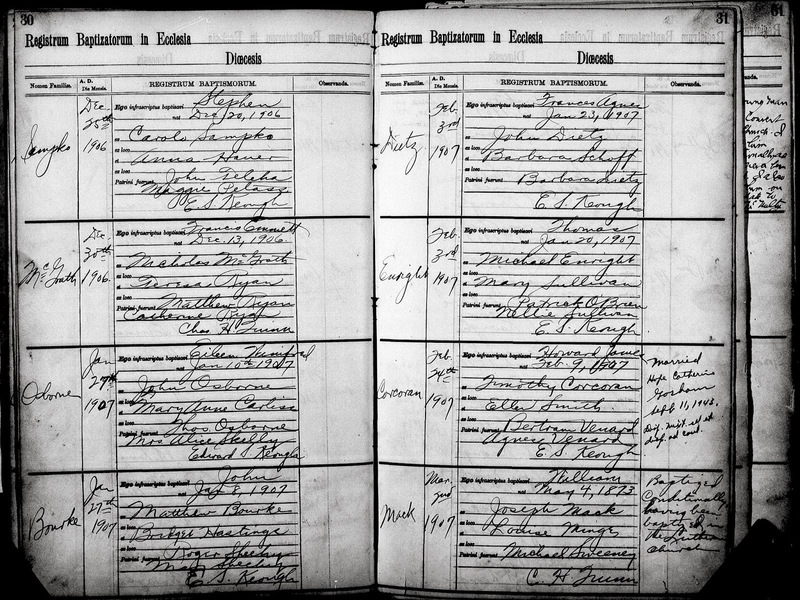 I found marriage, census, death and cemetery records using the information above. I was able to research his wives and children, too. It doesn't get much better than that. Do you have an obituary that is filled with genealogical treasures? I don't have many as complete as this one, but the ones I do have, I cherish. 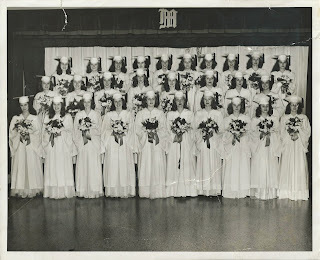 Kirk's mother, Elizabeth (first row, second from left), graduated from Marywood Academy in June, 1946. 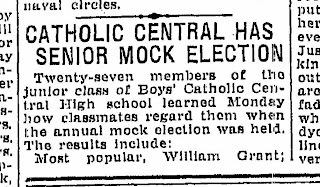 Marywood Academy was a private catholic school, located on East Fulton Street, in Grand Rapids, Michigan. It was a four story building situated on beautifully, landscaped grounds. A picture of it as it was in 1944 can be found here. The left side of the building was where the classrooms and rooms for boarding students were. Elizabeth was a day student, meaning she went home after school. The right side of the building was where the nuns lived. The chapel was in the center on the first floor. Kirk and I took a day and explored Grand Rapids. We took pictures that were genealogical in nature. The picture below is how Marywood looks now. 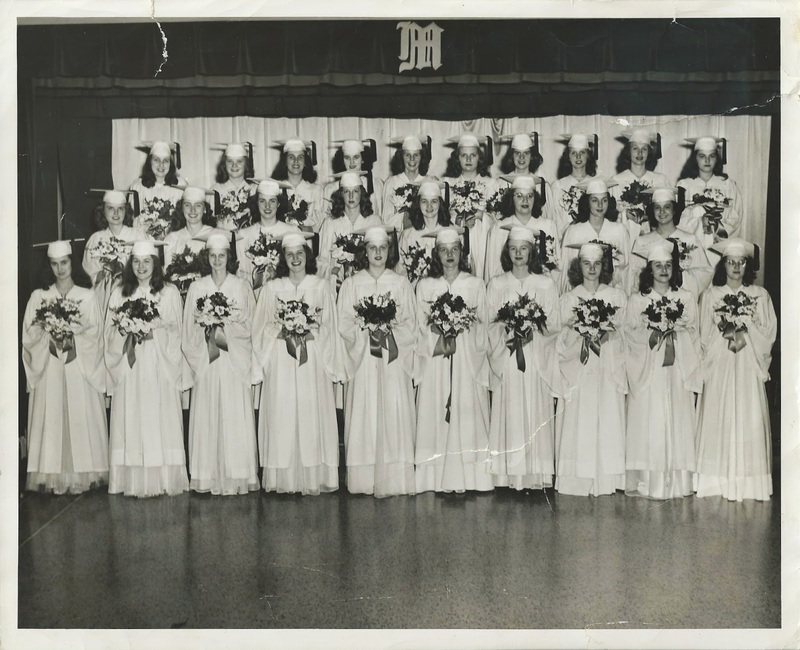 The 34 acre campus is no longer a school, but a home for Dominican Sisters. Space is leased to a few community programs, such as Headstart. Chapels, administrative offices, and a Health Center are located at Marywood. The Dominican Center is here, too. It is a place where groups can meet to hold retreats, conferences, etc. The trees have grown since Kirk's mother attended, but Marywood is still in existence, much as it was in the 1940's. It is a wonderful piece of Grand Rapids history and one of our family's history as well.